Two position lift chairs are capable of reclining from a seated position to a 45 degree angle and any recline position in between. Among the most popular of lift chairs, these recliners will lift the user to a standing position at the touch of a button. No hard to pull levers or complicated controls, just simple one-touch operation. 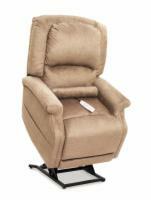 Best Feature: The Capri has the lowest price of any Golden lift chair.